The Body Spot values our local community. By partnering with local business we create lasting relationships, promote healthier lifestyles, and are able to offer our services at a discounted rate. Browse the local business below which we have already made community affiliations with. Appointments can be made online or by contacting us directly. If you qualify for our community discount please make sure to use the appropriate discount code during checkout. Please bring proof of your membership affiliation when you come in for your session. 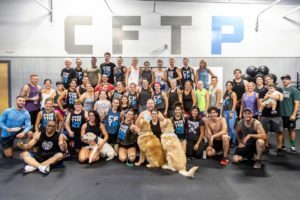 A local CrossFit gym that welcomes, encourages, and inspires anyone and everyone to show up, work hard, and live a happier and healthier life. Members of CFTP receive 15% off all services provided at The Body Spot. Use code CFTP15 at checkout. Eligible members of The Hot Yoga Spot receive 15% off any service. To receive this discount you must hold a valid class package or an unlimited monthly/yearly membership. Use code THYS15 at checkout. As a locally-owned and operated club, you will see the difference in how much ABC cares about you, as well as your health. You will feel and see the benefits of belonging to a smaller club. The Body Spot offer’s chair massage on site at ABC Monday’s from 4- 6pm. All members of ABC Sports & Fitness receive 15% off any service. Use code ABC15 at checkout..
All members of Orangethoery receive 15% off any service. Use code OTF15 at checkout. We are not your typical “gym.” VENT Fitness is a full service results-based gym and fitness center. We inspire members to reinVENT themselves through a commitment to health, fitness and hard work. We’re not a place of intimidation and we’re not about excuses or watered-down workouts either. At VENT Fitness we offer stronger programming, access to world-class amenities and smaller class sizes. We’re as committed to your workout as you are. All members of Vent receive 15% off any service. Use code VENT15 at checkout.